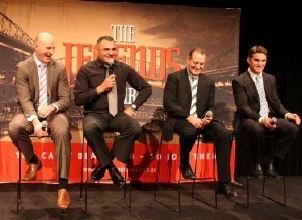 On the eve of the Bledisloe Cup, we invite you to join Wallabies Legend Mark Ella, the hilarious All Blacks Legend Eric Rush and other special guests for the Australia v New Zealand Sports Lunch. Our Sporting Legends will be discussing the upcoming Bledisloe Cup Series and will feature a tribute to the 1984 Grand Slam Wallabies as 2014 marks the 30 year anniversary. Enjoy this rare opportunity to enjoy a fantastic lunch in the company of some past greats of the game. 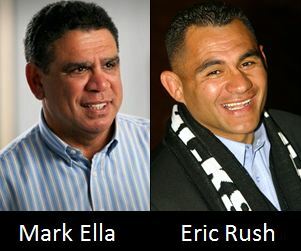 Mark Ella and the hilarious All Blacks Legend Eric Rush. *Premium beverages including beer, wine, and soft drink. *The opportunity to have a sporting legend sit at your table. *Live auctions, raffle and trivia challenge.